Booklet with liner notes in English and Finnish. Big band, electric guitar and symphony orchestra. It's remarkable how successfully they're integrated by Estonian composer Erkki-Sven Tüür (...). The performance is admirably tight and well-coordinated. The sonic components meet on the level of elementalised sound-blocks and motivic shapes, go their seperate ways, clash and congeal, in ways that range from the fascinating to the downright spellbinding (...). This new disc, superbly performed, recorded and annotated as it is, will be self-recommending in any case. 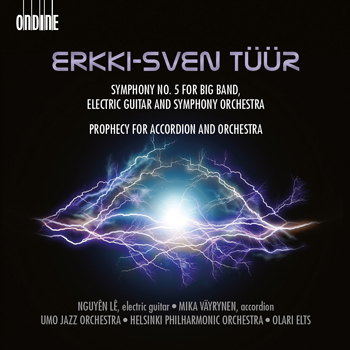 This exciting new release from Ondine includes two major works from one of the most interesting contemporary voices of today, Erkki-Sven Tüür (b. 1959). The album includes two works where the solo instrumentalist plays a significant role. Symphony No. 5 is written for Big Band, Electric Guitar and Symphony Orchestra. In this recording the soloist is the world-known and award-winning French jazz guitarist Nguyên Lê. Accordionist Mika Väyrynen, a pioneer in contemporary accordion music, is the soloist in Prophecy for Accordion and Orchestra, a work which he also premiered. Tüür's Symphony No. 5 mixes influences from various music genres in a fascinating way, it is also one of very few works where Western classical music is combined with elements from jazz and rock in a successful and profound way. Prophecy is a concerto for accordion and orchestra with a deep mystic background, the title referring to the extremely long and rich practice of "seeing things" through the history of different cultures and traditions. The music reflects energetic leves of this phenomenom. The new recording with the Helsinki Philharmonic Orchestra is conductor Olari Elts' debut recording on Ondine.